If I send a message that has U+200B at the end of it and then run /debug tags, there won't be any tags displayed for it. Other people who run /debug tags won't be able to view the tags for that message too. The word "message" is not displayed. Oh, sorry. Forgot to check savannah. So it's not displayed if there's space after \u200b ? Yes, I found the problem in code. It happens only if a whole "word" (delimited by spaces) has a length of zero on screen, so for example a word with one or more U+200B chars will cause the display problem. 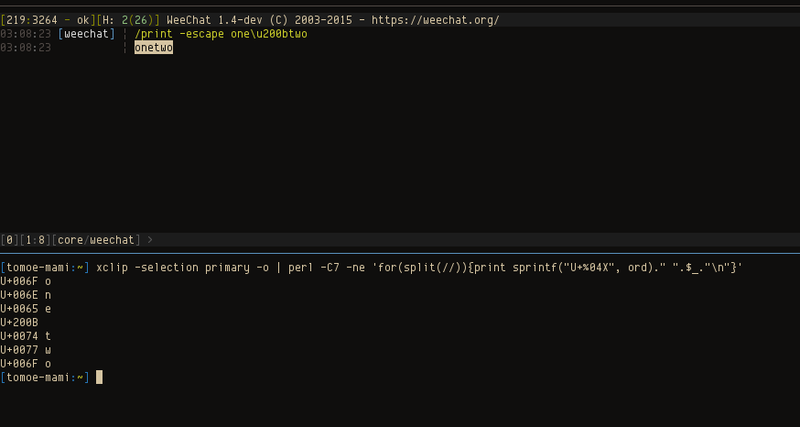 When WeeChat finds a word with length of zero (on screen), it considers the line has ended and displays a new line, which is wrong in this case.